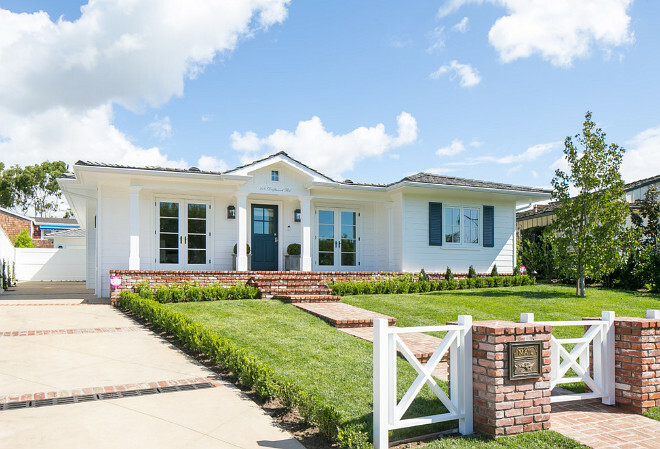 Located in Newport Beach, California, this ranch style home went through a full renovation and now features many great ideas! 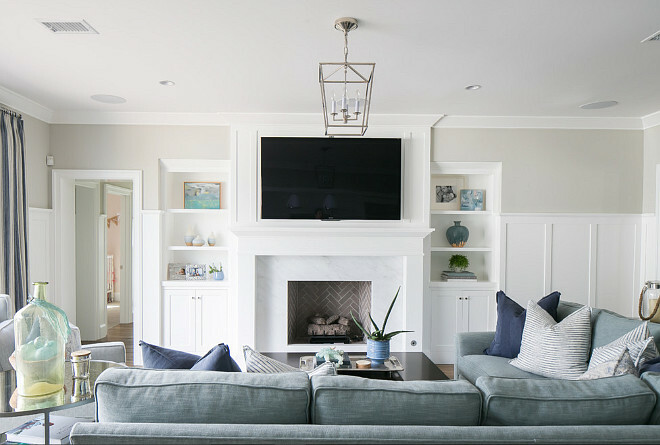 To completely change the outdated and dark look of this 1951 home, the incredibly talented interior designer Brooke Wagner, from Brooke Wagner Design, had to be very creative. The designer changed the layout of the rooms, creating an open concept which allowed an easy flow from room to room. 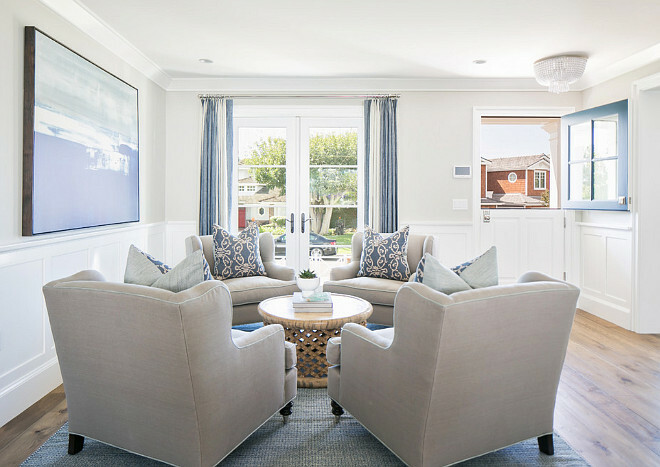 The interiors, painted in a fairly neutral paint color, are now bright and feel spacious, while coastal accents remind you that you are only one block away from the beach. 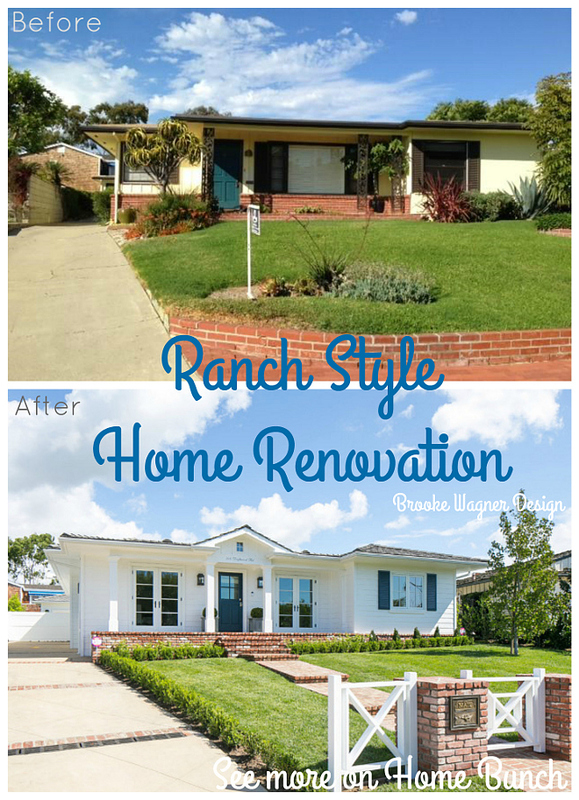 Start your week getting inspired by this beautiful ranch home reno. 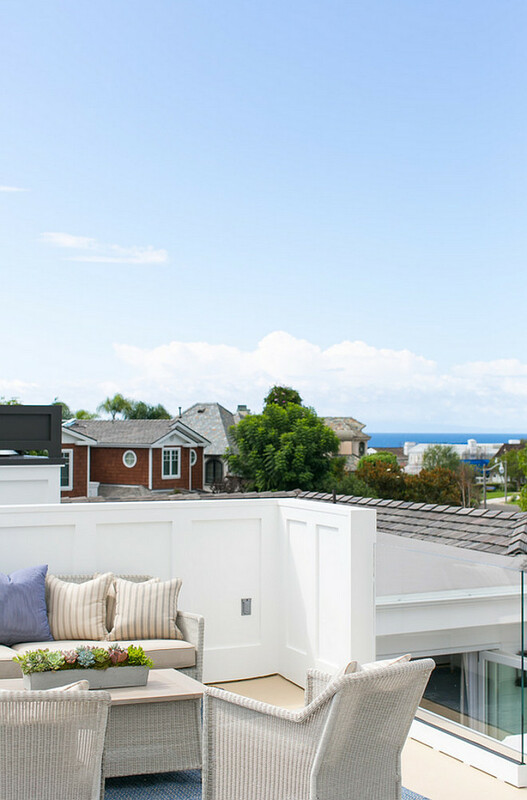 This home renovation is full of surprises and big changes! The front door paint color is Farrow and Ball Stiffkey Blue. Brick flooring adds charm and texture to this front porch. In fact, the brick looks terrific against the white exterior. 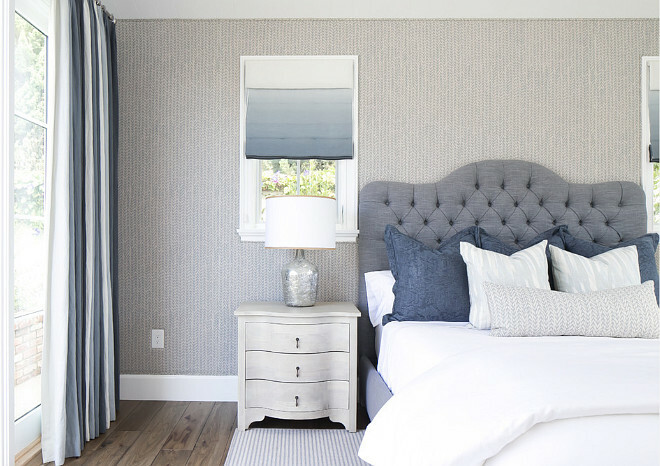 This home shares classic blue and white decor. Notice the beautiful Dutch-door and the French doors leading to the front porch. This is a perfect spot to enjoy a beautiful afternoon! Chairs are made by Barclay Butera. 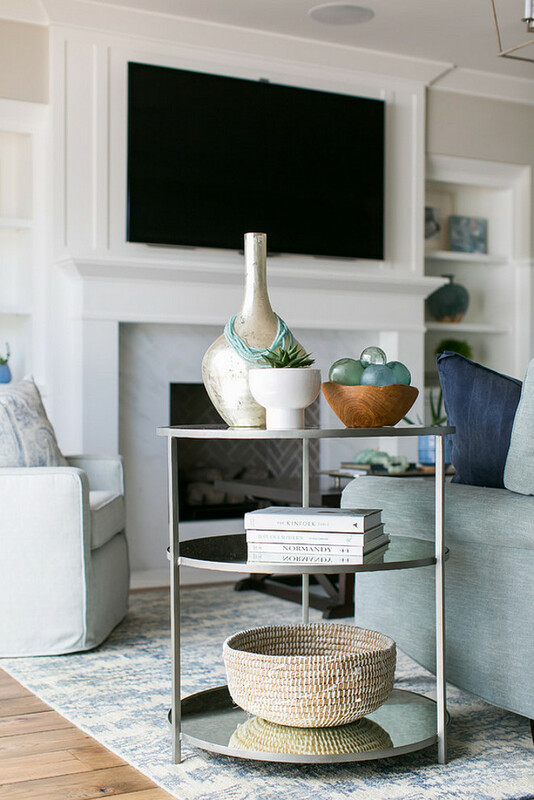 The rug is from Stark Carpet and the pillows are Lee Jofa. The art is Coastal Landscape on canvas from Benson-Cobb Studios. 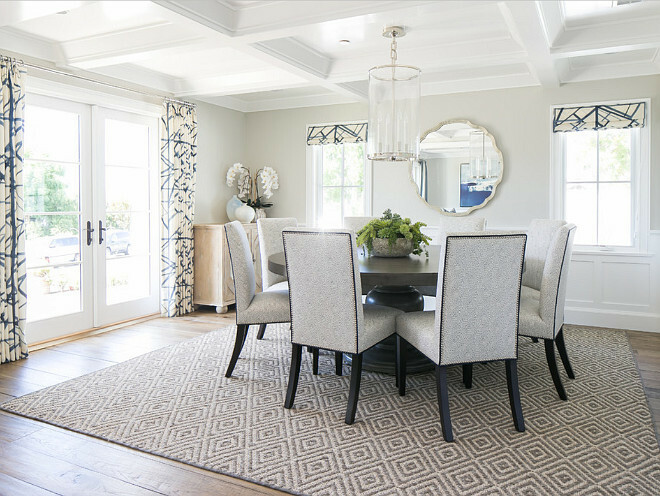 Coastal blues bring an inspiring feel to dining room. 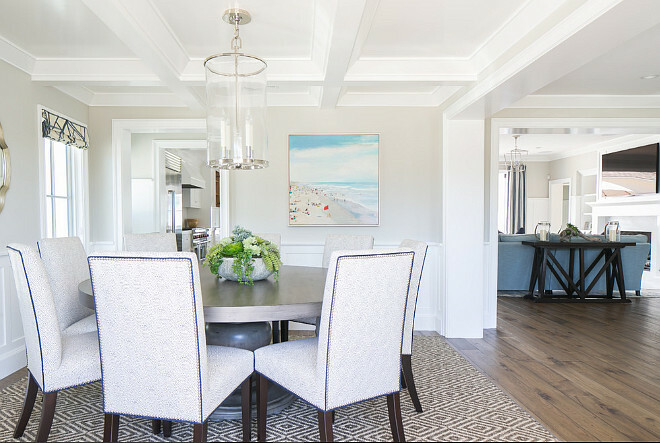 I am loving the coffered ceiling, white millwork and the neutral walls with the blue and decor. The paint color is Dunn-Edwards Shady DEC774. This is not a big house but it was designed with a smart, and open, layout in mind. 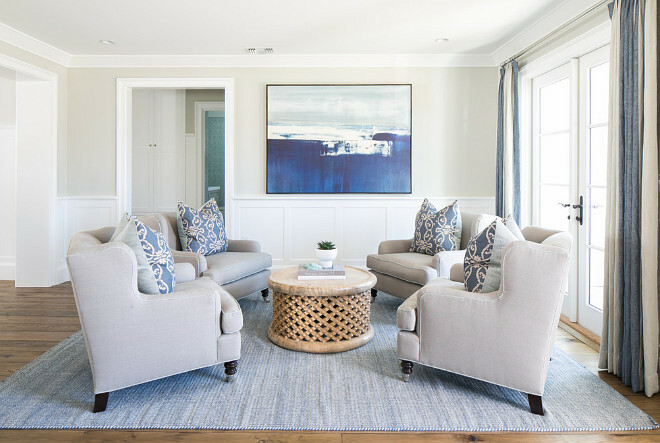 The family room features beautiful coastal decor and classic millwork. 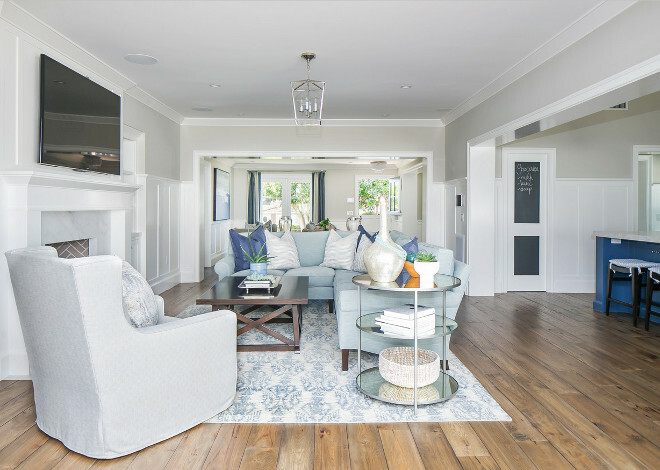 The wide plank floors are made by The Vintage Wood Floor Company in California. Planks are about 8″ wide. 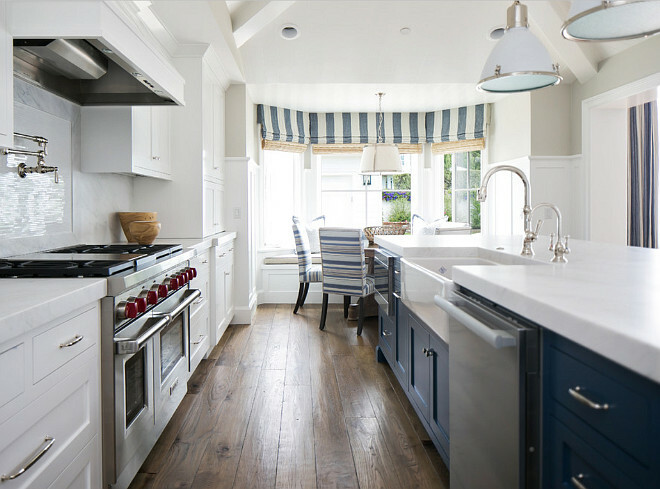 I am in love with this coastal kitchen. The blue island paint color is Farrow and Ball Stiffkey Blue 281. The white pendants are the Fulton Pendants by Ralph Lauren Home. The counterstools were custom made. 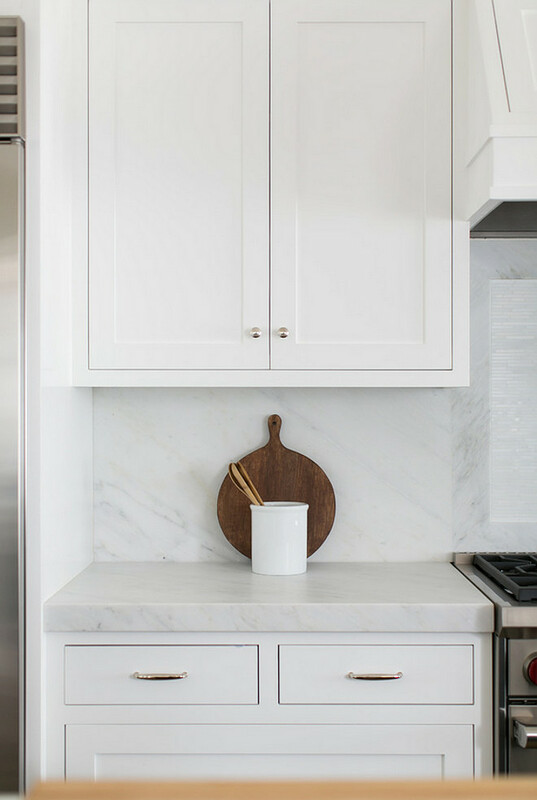 Kitchen countertop and backsplash is honed Pacific White marble. 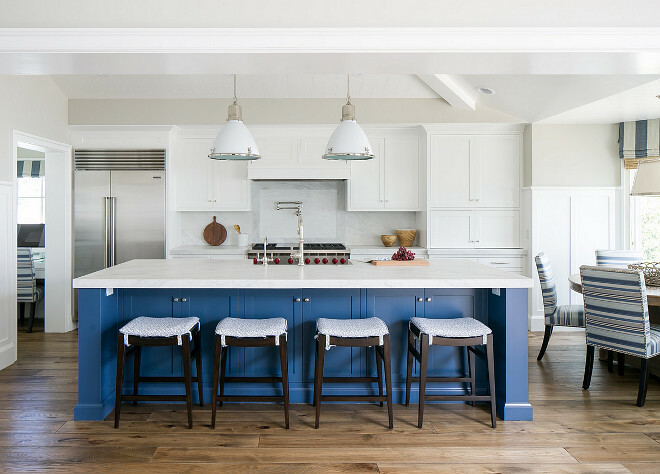 The crisp white cabinets work perfectly against the dark blue island and the blue accents in the breakfast nook. 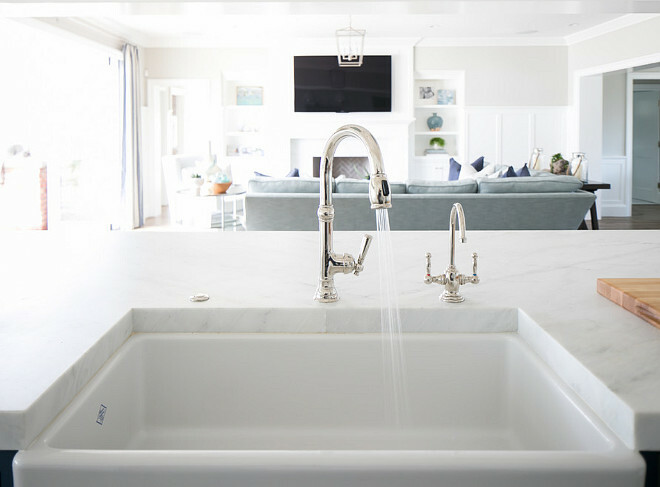 The kitchen faucet is Newport Brass Jacobean faucet in polished nickel. Isn’t this cozy nook adorable? 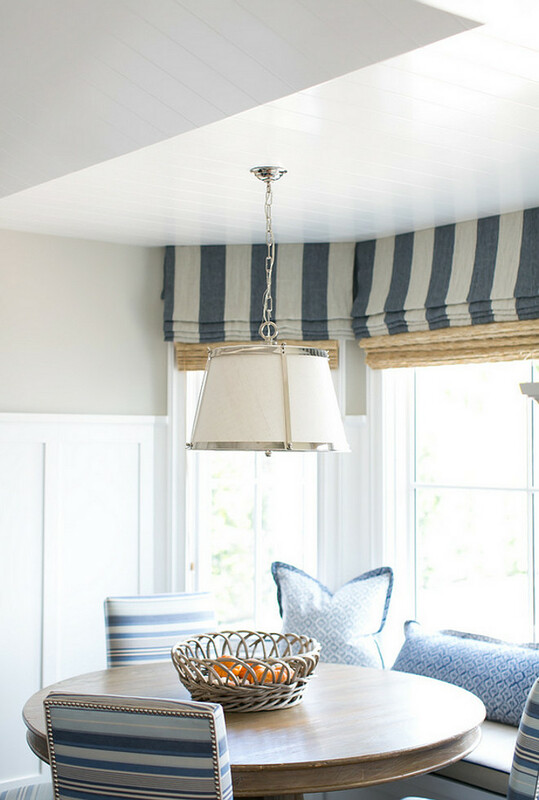 The bay windows feature striped roman valance and woven shades underneath. 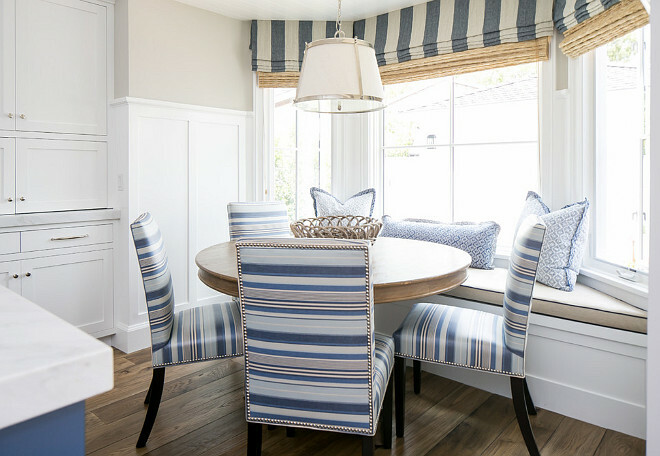 Striped chairs are custom made by Barclay Butera. 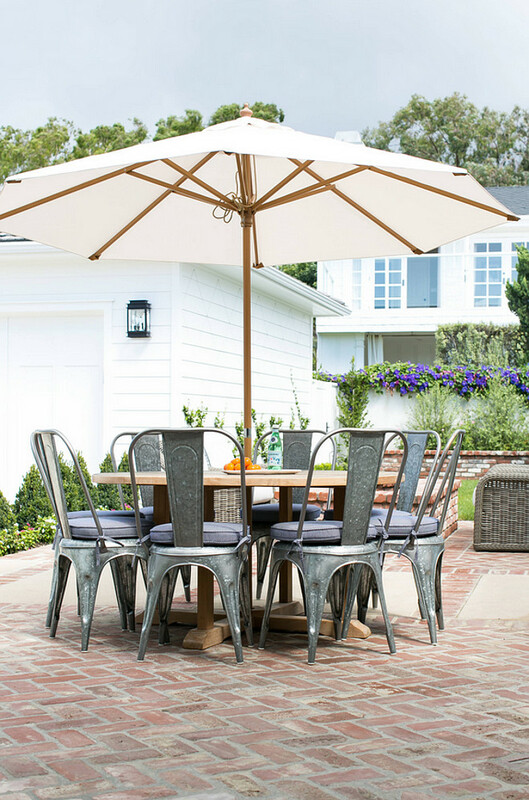 The family room opens to a welcoming patio with Tolix chairs. 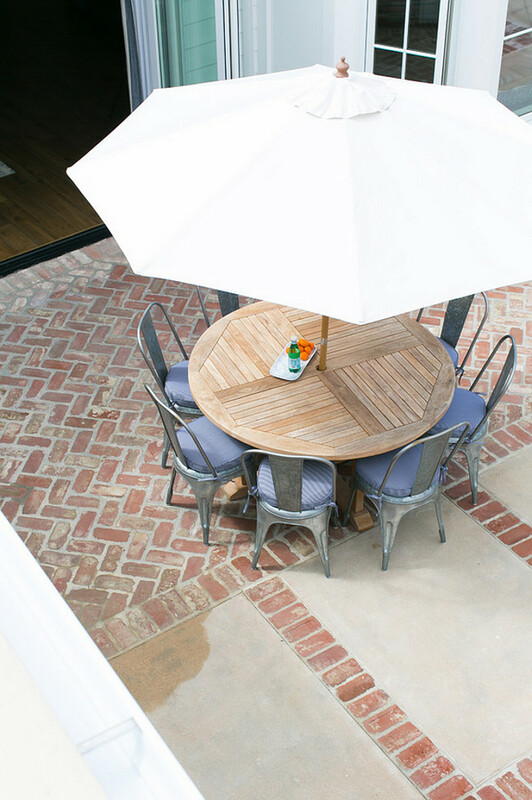 Patio combines brick and concrete flooring. 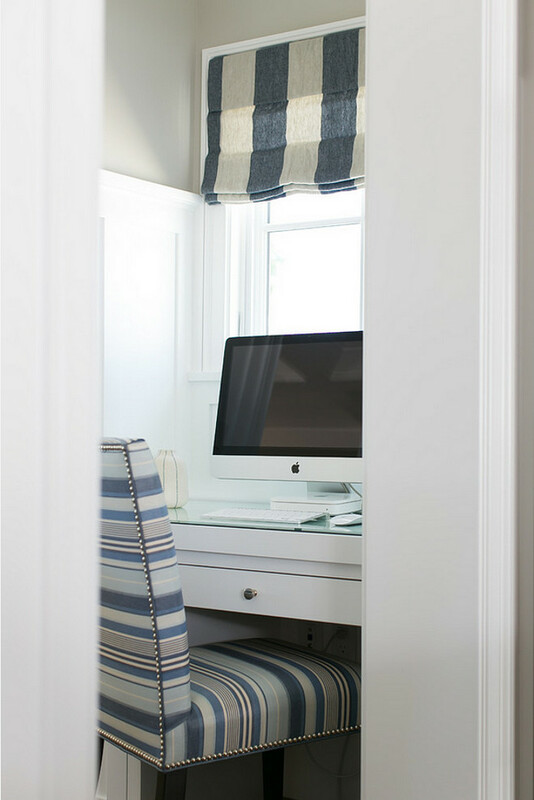 A small nook becomes a useful area with a built-in desk. 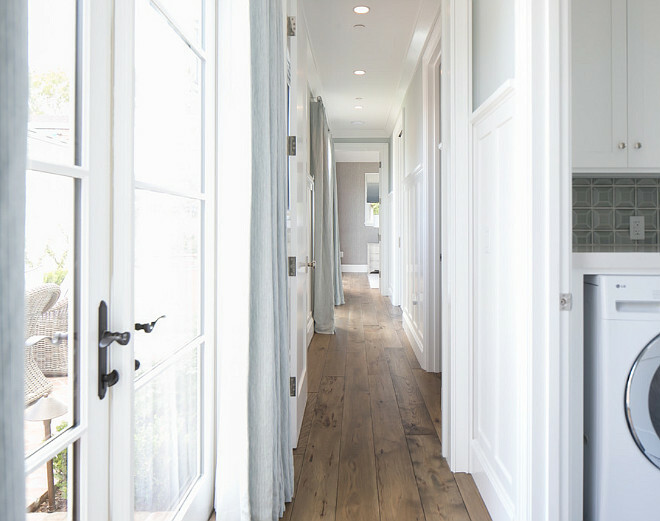 A long hall with wide plank floors and white millwork leads you to the bedrooms and to a laundry room. 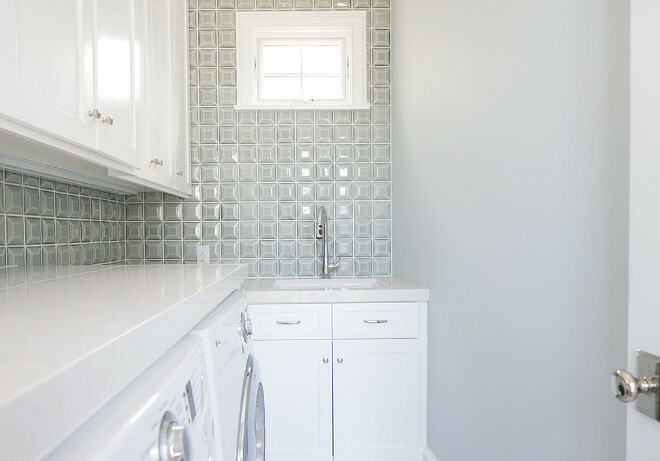 A geometric backsplash tile and white quartz countertop adds interest to this small laundry room. 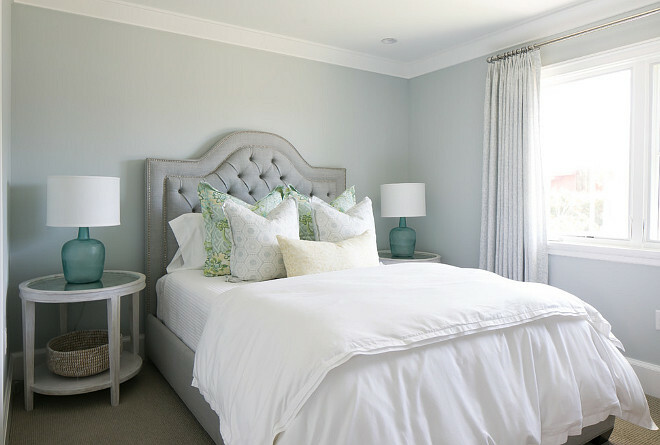 I’m loving the soothing colors found in this guest bedroom. 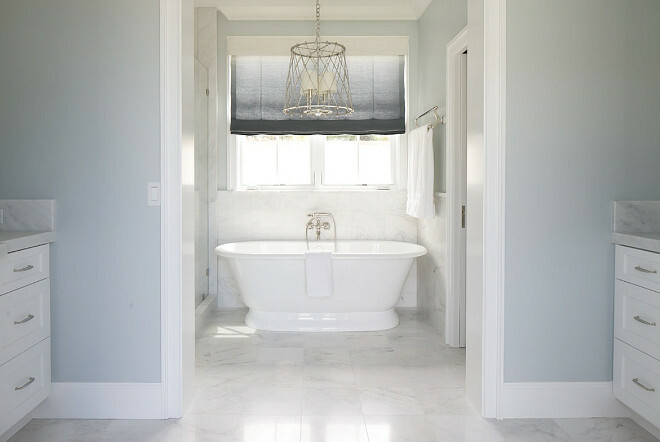 It’s uncomplicated and inviting! This baby girl’s nursery features an accent wall with wallpaper while the remaining walls were kept pale pink. 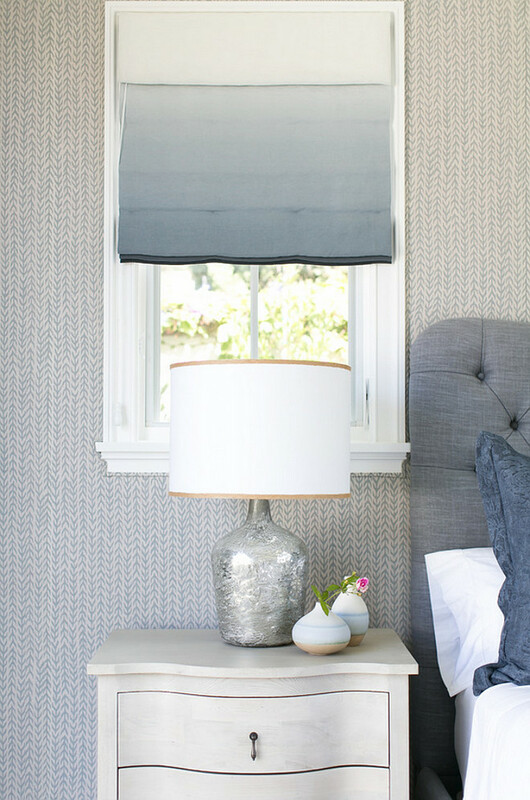 There’s a lot to love in this bedroom, including the ombré Roman shades. Aren’t they fun? The wall was upholstered with a fabric by Galbraith & Paul. An ombré Roman shade was used once again in the bathroom. 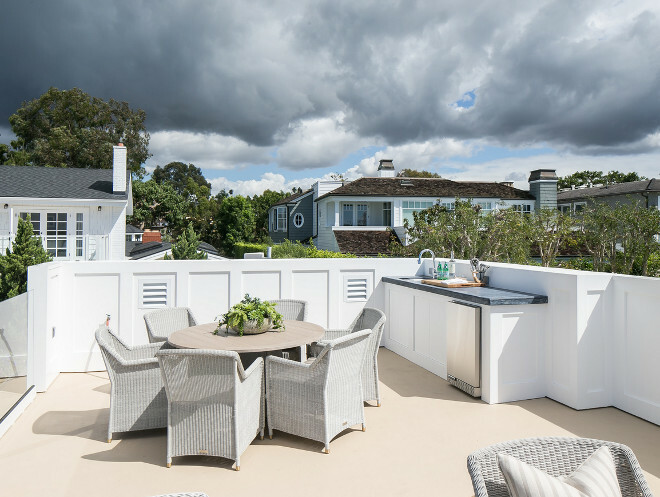 The best view of the house is seen from this stylish rooftop deck. 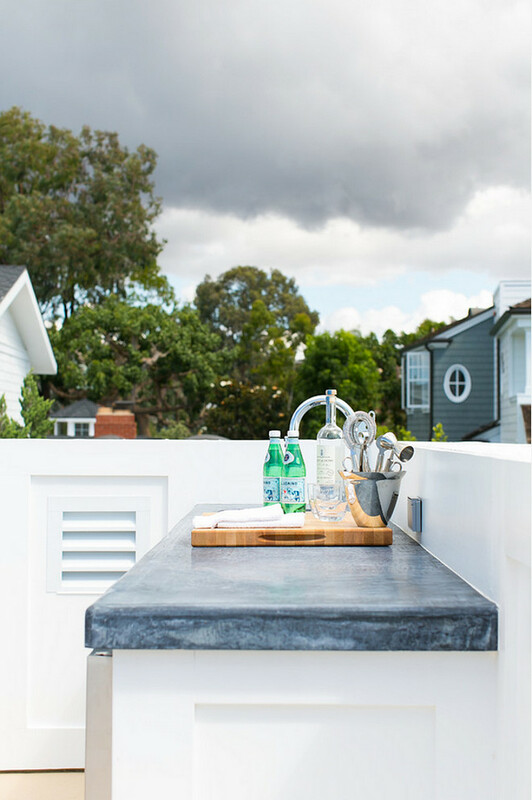 This outdoor kitchen features a stained concrete countertop. 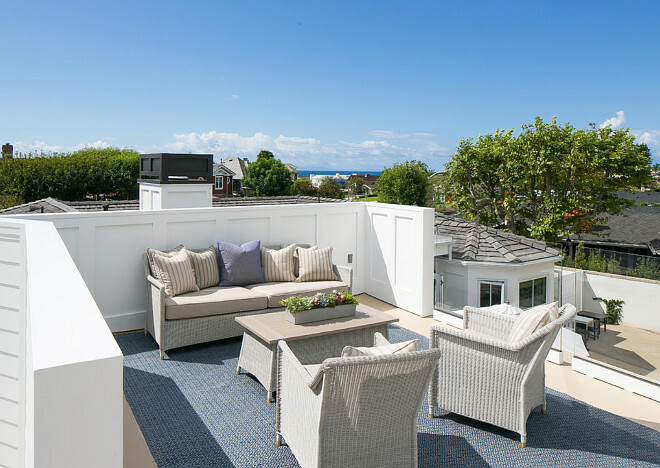 With only a block from the beach, this home really seems to be a perfect place to live at! In despite of feeling sick this week, I’m really looking forward to this week. I feel so positive about this moment of my life… it’s not that everything is perfect because it’s not, but I have so many reasons to feel grateful and happy that I really won’t waste my energy focusing on the negatives. I was telling my husband the other day on the importance of analyzing our own lives, what happened to us before and what is happening with us now. I feel that we only grow when we try to understand the circumstances of our life. And after taking all the lessons the circumstances can teach us, it’s important to move on. Everyone you meet have problems, you have, I have, we all have and that’s okay, it’s normal, it’s life. Take what you can take from these problems, learn from them, learn about yourself and the others and move on with your life. Focus on better days, create new opportunities. Do not allow yourself to become used to feel sorry for yourself and for your life. You need to be aware that problems appear to teach us something and after we learn, we need to free ourselves from them. Do not bring every problem that crossed our life on our back. Learn the lessons given to you. Resolve them and move on. Our soul becomes wiser when we free ourselves from all the heavy loads. You were born free, so stop creating cages around your beautiful spirit. Sources: Brooke Wagner Design. Photos by Ryan Garvin Photography. Amen to your comments Luciane. Glad you are feeling better ! What beautiful (and true) sentiments! Enjoy your week Luciane. 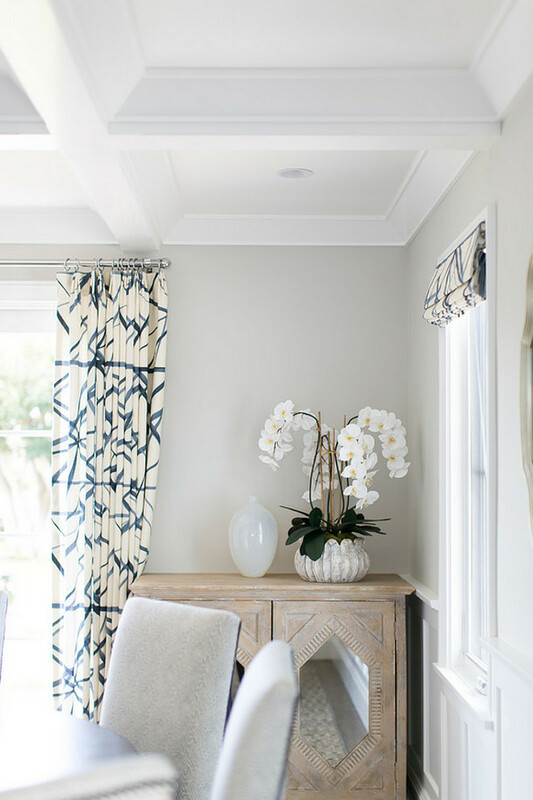 I love a great before and after and this is an amazing house – love the banquette! So happy you are feeling better and great advice and reminders to us all, Luciane! Wonderful,wonderful advice Luciane. I’m so glad you have (are) learning so much and share those things with us so we can learn too! Glad you’re feeling better too. This house was designed so beautifully- amazing job! 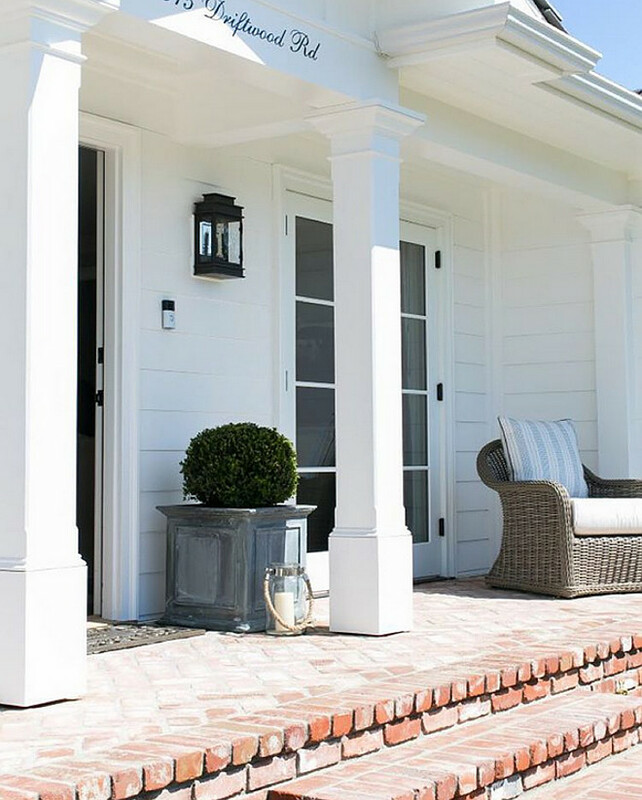 Where is the front porch planter from? Thank you!! I recommend you to contact the designer personally for more details on this.